This degree provides advanced professional training for careers in teaching, administration, and other educational services. The degree is offered in the following fields of education: adult education, art education, educational leadership, educational psychology, higher education, mathematics education, music education, science education, special education, and workforce education. Specialization in research training and in subject fields appropriate to elementary, secondary, and college teaching is provided. Departments that have been approved to offer the Doctor of Education degree may implement this degree program by the adoption of appropriate rules and regulations. Departmental rules and regulations may not, however, conflict with the policies, rules, and regulations of the Graduate School. Admission. An applicant who desires to pursue advanced professional training in education beyond the master’s degree, with a view to becoming a candidate for the Doctor of Education degree, will be expected to file formal application and present himself to the faculty of the appropriate department/division in the College of Education for special tests and interviews. Recommendation on admission will be made by the department only after its screening procedures have been carried out. Admission will be upon the recommendation of the graduate coordinator, or an authorized representative, and approval of the dean of the Graduate School. Residence. The degree presupposes a minimum of three full years of study beyond the bachelor’s degree and cannot be secured through summer work alone. 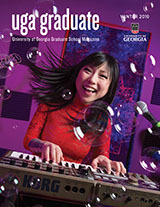 At least two consecutive semesters (i.e., enrollment for a minimum of 20 hours of consecutive course work included on the program of study) must be spent in full-time resident study on the campus of the University of Georgia, one of which may be a summer semester. Undergraduate courses taken either to fulfill research skills requirements or to remove deficiencies may not be calculated in the 20 consecutive hours of resident credit. Time Limit. All requirements for the degree, except the dissertation and final oral examination, must be completed within a period of six years. This time requirement dates from the first registration for graduate courses on a student’s program of study. A candidate for the doctoral degree who fails to complete all degree requirements within five years after passing the comprehensive examination, and being admitted to candidacy, will be required to take the comprehensive examinations again and be admitted to candidacy a second time. Advisory Committee. Before the end of the first year of residence of a prospective candidate for the Doctor of Education degree and upon the recommendation of the departmental graduate coordinator, the dean of the Graduate School shall appoint an advisory committee for the student. The committee must consist of a minimum of three graduate faculty members. Provisional graduate faculty may serve in the same capacity as regular graduate faculty but cannot serve as chair or co-chair of the committee. Additional voting members may be appointed to the committee, including no more than one non-UGA faculty, who must hold the terminal degree in their field of study. If there are more than three members, there must be greater than 50% graduate faculty representation. The committee will be recommended to the dean of the Graduate School by the graduate coordinator after consultation with the student and faculty members involved. The advisory committee, in consultation with the student, is charged with planning the student’s program of study. It is also charged with approving the program of study, arranging the comprehensive written and oral examinations, approving a subject for the dissertation, approving the completed dissertation, and approving the student’s defense of his/her research. The committee should advise the student of required research skills and other requirements. Departmental recommendations for the advisory committee, and any replacements, shall be determined by procedures approved by a majority of the graduate faculty of the department. Programs of Study. A preliminary program of study based on a minimum of 80 semester hours of course work beyond the baccalaureate degree, excluding dissertation credit, will be submitted to the graduate coordinator by the end of the student’s first year of residence. The program of study must be developed by the major professor and the doctoral student and approved by the advisory committee with no more than one dissenting vote. The program of study should constitute a logical whole and be significantly related to the student’s vocational objectives. A minimum of 30 credit hours of course work, exclusive of dissertation credit, must be taken at the University of Georgia at the doctoral level; i.e., 40 total credit hours must be taken at the University of Georgia. A minimum of three hours of 9300, doctoral dissertation, must be included on the program of study. The program of study should consist of 16 or more hours of 8000- and 9000-level courses in addition to research, dissertation writing, and directed study. No grade below C will be accepted on the program of study. To be eligible for graduation, a student must maintain a 3.0 (B) average on the graduate transcript and a 3.0 (B) average on the program of study. A final typed program of study will be submitted to the Graduate School prior to notification of the comprehensive examination. This program of study must be submitted on the proper form for approval by the advisory committee, the graduate coordinator, and the dean of the Graduate School. The final program of study should show all graduate courses relevant to the doctoral program and not just courses satisfying the minimum degree requirement. Courses from the master’s degree and courses taken at other institutions should be listed in the “Relevant Master’s and Other Graduate Degree Courses” section of the program of study form. The program of study must carry a minimum of 33 hours of course work, three hours of which must be dissertation writing (9300). The department should evaluate carefully and fully each doctoral student’s progress and qualifications at the end of each year of study in order to advise the student whether or not to continue in the program. Comprehensive Examinations. A student must pass formal, comprehensive written and oral examinations before being admitted to candidacy for the degree. These examinations are administered by the student’s advisory committee. The written comprehensive examination, although administered by the advisory committee, may be prepared and graded according to the procedures and policies in effect in the student’s department. The oral comprehensive examination will be an inclusive examination within the student’s field of study. An examination of the student’s dissertation prospectus (proposal) may precede or follow the oral comprehensive examination but may not take the place of the oral comprehensive examination. All members of the student’s advisory committee must be present simultaneously for the oral examination and prospectus (proposal) presentation. The oral comprehensive examination is open to all members of the faculty and shall be announced by the Graduate School. The graduate coordinator must notify the Graduate School of the time and place of the examination at least two weeks before the date of the examination. Following each examination, written and oral, each member of the advisory committee will cast a written vote of pass or fail on the examination. To pass each examination the agreement of the advisory committee is achieved with no more than one dissenting vote. An abstention is not an appropriate vote for the comprehensive examination. The results of both examinations will be reported to the Graduate School within two weeks following the oral examination. Dissertation Planning. The dissertation, being the most important single requirement for the Doctor of Education degree, should demonstrate the intelligent application of appropriate research procedures to the investigation of a problem in educational theory or practice. The dissertation problem must be conducted on some subject related to the student’s major field of study and demonstrate evidence of scholarly ability and a thorough evaluation of relevant source materials. The conclusions must be logical, the literary form acceptable, and the contribution to education theory or practice substantial. Persons who serve on the advisory committee at the time the dissertation research is undertaken must be faculty members knowledgeable in the areas of the student’s research. They should be selected irrespective of their departmental affiliation. The major professor and advisory committee shall guide the student in planning the dissertation. The student will prepare a dissertation prospectus. When the major professor certifies that the dissertation prospectus is satisfactory, it must be formally considered by the advisory committee in a meeting with the student. This formal consideration may not take the place of the comprehensive oral examination. Approval of the dissertation prospectus signifies that members of the advisory committee believe that it proposes a satisfactory research study. Approval of the prospectus requires the agreement of the advisory committee with no more than one dissenting vote as evidenced by their signing an appropriate form, which, together with the approved prospectus, is filed with the graduate coordinator. The major professor has the primary responsibility for guiding research, but the student should consult all members of the advisory committee to draw upon their expertise in relevant areas. After admission to candidacy, a student must register for a combined total of ten hours of dissertation or other appropriate graduate credit during the completion of the degree program. Students planning to graduate the same semester they enter candidacy must be admitted to candidacy by the published deadline for candidacy during that semester and register for ten hours. The student must also meet all other deadlines for graduation in that semester. A student must register for a minimum of three hours of credit in any semester when using University facilities, and/or faculty or staff time. Dissertation Approval and Defense. When the major professor is satisfied with the completed dissertation, he or she will certify that it has his or her approval and is ready to be read. The major professor will then distribute copies of the dissertation to the remaining members of the advisory committee and schedule a final oral defense. The graduate coordinator must notify the Graduate School at least two weeks prior to the defense. Subsequently, the Graduate School will announce the time and place of the defense of the dissertation to the University community. The committee members must have three weeks to read and evaluate the completed dissertation. Written assent of the committee members (other than the major professor) will be required before a dissertation will be approved as ready for a final defense. No more than one dissenting vote may be allowed for the approval of the dissertation. If the advisory committee declines to approve the dissertation as ready for the final defense, the major professor will notify the student and the Graduate School. The defense of the dissertation will be chaired by the student’s major professor and attended by all members of the advisory committee simultaneously for the entire examination period. It is open to all members of the University community. The student’s dissertation and defense must be approved by members of the advisory committee with no more than one dissenting vote and who must certify their approval in writing. An abstention is not an appropriate vote for the final defense. The results of the defense of the dissertation must be reported to the Graduate School at least two weeks prior to graduation for the current semester. Submitting the Dissertation. One complete formatted copy of the dissertation must be electronically submitted to the Graduate School for a format check no later than four weeks prior to graduation. The Graduate School must receive the Final Defense Approval form and an electronic submission of the corrected dissertation no later than two weeks prior to graduation. This official copy of the dissertation will be electronically submitted by the Graduate School to the main library for archiving. All requirements for the degree must be completed and reported to the Graduate School no later than one week prior to graduation. A student must enroll for a minimum of three hours of credit the semester in which graduation requirements are completed unless additional stipulations are required by other units of the university.